Hot on the heels of Gizmodo’s news story exposing the anti-conservative bias with Facebook’s Trending Topics, Facebook reiterated that it’s guidelines for its editors call for giving all people a voice. Per Gizmodo, some of its former editors say that in fact Facebook suppresses conservative voices and raises to the forefront liberal voices such as Black Lives Matters even though they are not actually trending. Facebook also posted a list of its news sources which included some conservative sites such as Drudge Report, Breitbart and the Washington Times but consisted primarily of mainstream media sites which slant liberal and some very left leaning sites including Huffington Post, Salon, Daily Kos and Gawker. Facebook might want to consider adding some more popular conservative publications in order to expose their young east coast liberal editors to other points of views. Facebook gave visitors the impression that its Trending Topics were entirely algorithmically chosen based on which stories had the most mentions, shares and likes within Facebook, when in fact the ultimate decision is human. The Guardian reported that Facebook gave customers information about the Trending Topics stating, “The topics you see are based on a number of factors including engagement, timeliness, Pages you’ve liked and your location.” The Guardian uncovered documents that Facebook backed off on a pure algorithmic solution when some users complained that it wasn’t linking to enough stories about the unrest in Ferguson, Missouri. That’s interesting in itself in that the Left’s narrative on Ferguson is about a protest because of the shooting by a police office of an unarmed black man and the ensuing justified protests. This marked the formation of the Black Lives Matters movement which according to Gizmodo was one of the story topics that was artificially promoted to Facebook’s Trending Topics in order to further promote that movement. What irks conservatives is the fact that this story is covered by the liberal press as a justified protest of an unjustified shooting. The facts are Michael Brown robbed a store and when confronted by a police officer Brown physically hit the officer and then tried to grab his gun. The unrest that followed is also covered up in that it wasn’t just a peaceful protest as much as it was mass looting of businesses with people carrying TV’s and liquor out of stores and then burning the stores down. 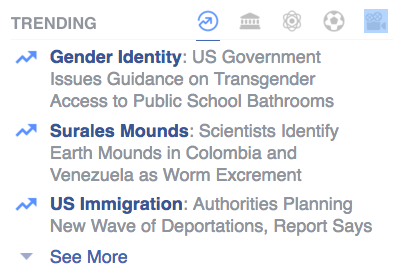 The trending topics on Facebook should be about truth not politics. The problem with the Left, and Facebook is clearly run by people with liberal views, is that they have no problem censoring conservative viewpoints as if they are not valid, while blindly promoting their own viewpoints which too often leave out inconvenient truths. This story has steam because it is part of the bigger story of the current left such as college campuses banning conservative speakers, anti-Trump protests where they try to not let his voice be heard, safe zones on college campuses where only leftist politically correct conversation is allowed , the conspiracy of state attorney generals suing those who don’t believe in human caused global warming and where Democrats and some on the FCC want to ban the Drudge Report and Rush Limbaugh. The left is upset that its monopoly on media has been broken by talk radio, cable TV and the internet and it wants its power to push its radical views back. Facebook censoring conservative views is simply symptomatic.